Winter Camp 2012 will be our 8th installment of the Camp series. These camps provide an opportunity for maintainers and other interested people to meet in person and work together more closely. They have been extremely beneficial for addressing pending issues and improving the OpenCSW experience. 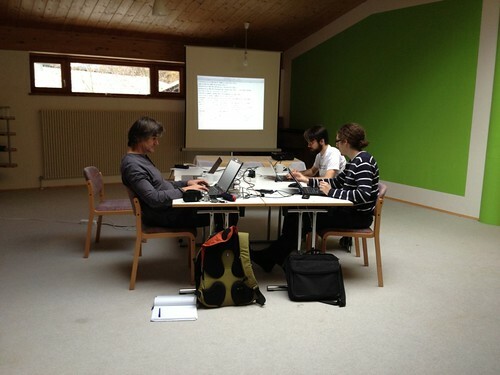 The OpenCSW Winter Camp will take place near Munich/Germany, in a small conference hotel a bit into the mountains. Friday 9.11.2012 - Sunday 11.11.2012. Arrivals on Thursday evening or Friday, Camp on Friday/Saturday/Sunday. Seminar venue and hotel are combined this time. Rooms will be pre-booked by Dago and are around 124 EUR per night including accomodation, meals and conference fee. Please let him know whether you are attending by the 29. September 2012. Late bookings might be possible, but can't be guaranteed. Standard bookings will be from Friday to Sunday, if you would like to stay longer/shorter, let Sebastian know. Transfer to/from Munich airport is approx. 2 hrs, to/from Munich central train station is approx 1hrs (directions). This is still a work in progress, ideas welcome (just edit the page and add things that you feel are interesting or important). If you don't have write access to this wiki (and don't bother getting one) you can also send your ideas to Dago (dam @ opencsw.org) and he will update the lists accordingly.